When I was growing up, Skate videos were a low quality affair with men in shopping trolleys, armed with VHS cameras, being pushed along next to guys popping ollies. If you were lucky, the best you would get is a bit of fisheye lens action and some comedy outtakes. 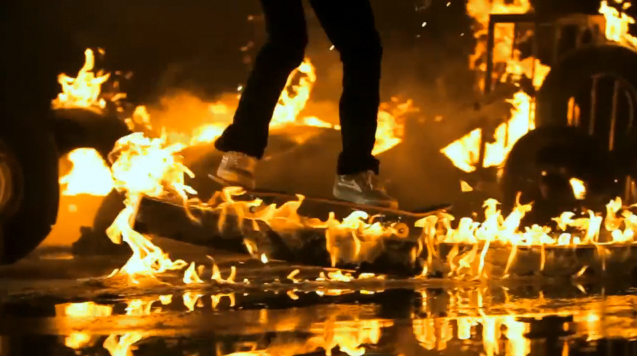 Nowadays, things have come a long way with the Spike Jonze produced, fire-laden Skate video Lakairomania. Directed by Marc Ritzema and shot on the RED MX, Canon 5D and 7D, this sumptuous 5 minute (10 minutes if you include the titles) special fx driven video is a joy to behold and one of the best skate videos I’ve ever seen.